We know how much you love mac and cheese. Now you can add some variety to your favourite baked pasta with a few simple add-ins - try our Swiss Mac'N Cheese with grated Swiss cheese and green beans. WHISK butter, flour and milk in a microwaveable bowl. Microwave on HIGH power for 6 minutes or until bubbling, stirring 2 or 3 times until smooth. Add cheese and stir until melted and mixture is smooth. COMBINE mixture with cooked macaroni; spoon into a greased baking dish. 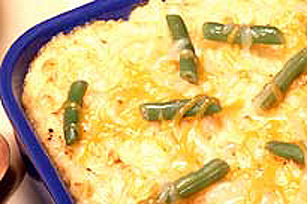 Top with green beans. BAKE at 350°F (180°C) for 20 minutes or until hot and bubbling.